This pool-based clinic is a quick introduction to the basics of kayaking. It is ideal if you are wondering if kayaking is for you, or to prepare for travelling somewhere hot this winter! You will be taught how to safely get into and out your kayak and a few of the basic strokes to get you going. This 90-minute clinic is a great opportunity to learn to roll your kayak, or to improve whatever parts of the roll you have. The low participant:instructor ratio ensures every participant receives quality individual attention. This is not a beginner course. Participants should be able to do a basic roll already. Here we will work our way through the movements for some of the simpler Greenland rolls. You do not require a Greenland-style paddle or kayak to participate. What would you do if you flipped your kayak and had to get out? This pool-based clinic will introduce you to a variety of self-rescues and assisted rescues. This is a “hands on” program, so come prepared to participate fully. 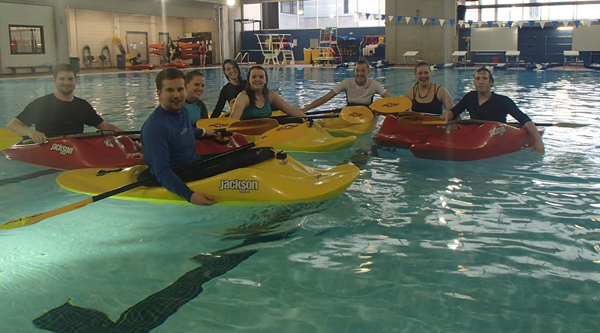 Undercurrents hosts pool sessions throughout the off-season so that paddlers can practise their skills without an instructor. It is a great excuse to do a little paddling and socializing while the weather is cool!